Your credit card will be charged the day of your cruise. The price charged to your credit card for all cruises with food is for meals, taxes, fuel surcharge, and embarkation fee. For Scenic and Sunset Cruises, the price charged includes the cost of the cruise, taxes and fees only. All drinks, appetizers, and gratuity are an additional charge and can be purchased on board. Children under 3 are considered a lap passenger and they are not guaranteed a seat of their own. If you would like to guarantee a seat for your child under 3, you will need to pay the full child rate, instead of the $2.00. 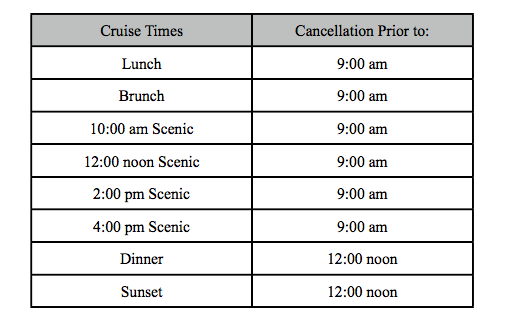 If you need to cancel or change your cruise reservation please call us at 802-862-8300 or e-mail us at reservations@soea.com before 9:00 am for a lunch, brunch, and all scenic cruises (10, 12, 2, and 4) and before 12 noon for dinner and sunset cruises. If you fail to cancel or change before the times indicated, your credit card will be charged the total cost of the cruise. Special Event Cruises including but not limited to: Late Night cruises, UVM Graduation Dinner, UVM Homecoming and Champlain College Parents Weekend are not part of our regular scheduled events. These cruises are non-refundable and all sales are final. When you arrive at the boat for your cruise you may qualify for express check in. If you have made a reservation for a Lunch, Brunch or a Dinner Cruise your guest check will be waiting for you outside the ticket booth. Guest checks are listed alphabetically by last name. Your credit card has been processed and you are welcome to board. If you have arrived and your check guest is not outside the ticket booth, please see ticket booth attendant for further information. If you have made a reservation for a Scenic or Sunset cruise you will need to check in at the ticket booth to receive your boarding passes. To receive coupon discounts, coupons must be mentioned/entered at the time of the reservation to receive the discount. Coupons given the day of the cruise after the credit card has been charged will not be refunded. If a gift certificate or coupon needs to be redeemed, it needs to be brought to the ticket booth attendant to be honored. If you do not have your gift certificate or coupon in hand at check in, the gift certificate or discount will not be honored and your credit card will be charged the additional amount. Guests are prohibited from bringing beverages (alcoholic and non-alcoholic) and food of any kind on board the ship. No food is allowed off the ship, except for celebration cakes purchased on board. Alcoholic beverages will not be sold or served to anyone under the age of 21. We reserve the right to refuse the sale of alcoholic beverages to anyone. Guests who have special needs must contact us at 802-862-8300 to make any necessary arrangements. The first level of the ship is handicapped accessible. Our vessel does not have elevators. There are 13 stairs to both the second and third decks. Accordingly, a physically challenged guest will require the services of a responsible adult since crew availability is limited in most circumstances. If we have prior notice, we will try to accommodate all guest needs, but cannot guarantee that we can meet the needs of every guest. The Spirit of Ethan Allen reserves the right to cancel a public cruise whenever, in its sole judgment of the vessel owner or operator, conditions warrant it. You will not be charged for any cancellations made by the company. Please note we will need a minimum of 15 paying passengers to operate any scenic cruise. If we do not meet the minimum, the cruise will be cancelled, and you will be refunded or you are welcome to reschedule. The boat departs from the Burlington Boathouse on 1 College St. Burlington, VT 05401.